The Asian Resource Center for Decentralization is an online platform for sharing and exchange of resources on decentralization theory and practice in Asia. Prejean Prieto & Raphael Montes, Jr.
Camarines Norte’s attention to persons with disability dates back to the creation of its Social Welfare Services Office, and has been enhanced through various mechanisms like the Provincial Committee for the Welfare of Disabled Persons (PCWDP, 2002) and PCWDP’s reorganization to the Provincial Council of Disability Affairs (PCDA, 2012). It was only in 2015 when the CN-PDAO was created and operated under the PSWDO. CN-PDAO officially became a separate office (under the Office of the Governor) in 2017. Currently, CN-PDAO has its own dedicated budget. After the two-year transition period, CN-PDAO’s separation from the PSWDO has indicated signs of awkwardness between the two offices, although both are open to collaborative engagements in the future. Appointment of the PDAO Head has gone through a complex yet interesting process. The current Head receives an SG 18 salary, lower than what the law provides. CN-PDAO is composed of four employees, but it has only one plantilla position (Head). 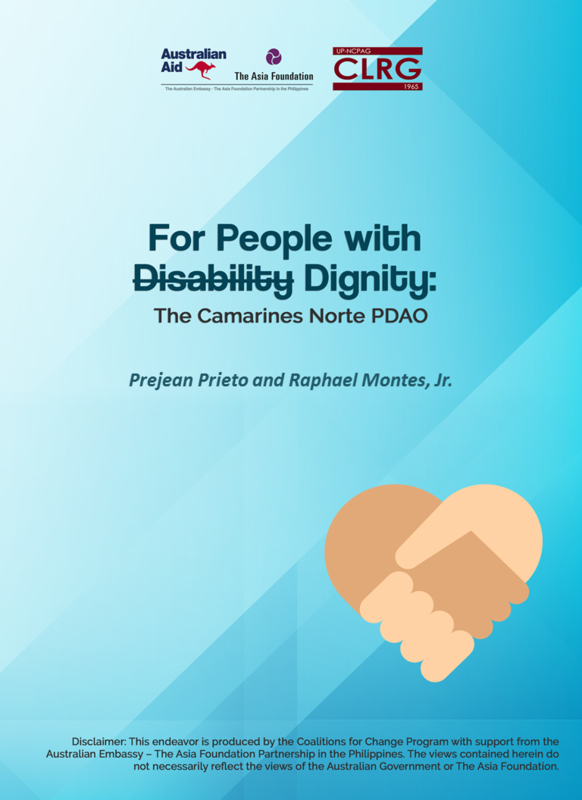 The major initiatives of the CN-PDAO in the last two years include municipal awareness orientation, organization of PWD associations/federations, advocacy radio program, accessibility audit with DPWH, wheelchair lift, retrofitting of provincial government access facilities, and securing scholarship slots for PWDs.